Mild temperatures and periodic weak weather systems were the common themes during the month of October. Although temperatures were around or slightly below average during the day, overnight low temperatures were well above average, making October the third consecutive month of warmer than normal conditions in central Washington after six months of cooler than average conditions. Temperatures were generally around 1 to 1.5 degrees above normal in eastern Washington, but only slightly above normal in western Washington. A warm air mass and poor radiational cooling conditions were the two causes of the warm night-time conditions. The AWN site at Moxee observed the warmest October average low temperature since at least 1989. The first widespread frost in south-central Washington occurred on the morning of Tuesday, October 25th, with low temperatures ranging from the upper teens in Ritzville to the 40s in warm regions such as Wahluke Slope (44°F), which is near Mattawa, and Tokeland (41°F), which is on the coast. However, temperatures quickly warmed into the 50s during the afternoon. The following morning (Wednesday, October 26th) featured similar conditions, and nearly all areas of central and eastern Washington fell below freezing. Interestingly, the only notably cold mornings of the month occurred from October 25th to the 27th. The warm overnight low temperatures were the result of a mild and moist southwesterly flow and a warmer than normal air mass with relatively high dew point temperatures. Moisture in the air acts as a source of latent heat, and prevents significant night-time cooling. Even on clear and calm nights, the temperature will not drop below the dew point because of condensation. On many nights during October, the surface was unable to decouple from the atmosphere as it often does during autumn, due to winds and mixing from passing systems. Night-time radiational cooling was further inhibited by periodic cloud cover. Locations such as Moxee that normally experience significant radiational cooling at night were most affected by the weather pattern of the past month and thus recorded more significant positive departures from normal than other locations. Unlike during the spring, most of Washingtons October cooling comes from in-situ radiative heat loss that occurs as the land cools in response to decreasing solar radiation. October is truly a transition month for central Washington. The average temperature drops significantly during the month. Unlike the slow rise of temperatures that occurs during the long springtime period, central Washingtons brief autumn season is highlighted with quickly falling temperatures as we progress, seemingly instantly in some years, from summer to winter during October. While temperatures in the 80s are commonplace early in the month, 20s are common by Octobers end. At Prosser (WSU IAREC), the historical average high temperature falls by nearly 20 degrees from October 1st (73.1°F) to Halloween (53.9°F). Also, the complexion of the weather pattern changes, as the jet stream may become more active over the Pacific Northwest during the month, while the continent generally becomes cooler than the Pacific Ocean by Octobers end. Although October and April have very similar average temperatures in central Washington, they are entirely different types of months, since the average temperature change is more drastic in October than in April. Specifically, early October is much warmer than late April, while late October is much cooler than early April, such that these two months are certainly not mirror images of one another. October began with a transition from above average temperatures and summer-like weather to cooler and fall-like conditions. Periods of rain fell from the third to the sixth of October with cloudy conditions area wide and particularly windy conditions at the coast. Following this wet period, temperatures were generally above normal for much of the rest of the month. Another wet system impacted the northwest on Monday the 10th, bringing rainfall and windy conditions. Tuesday, October 11th was mostly sunny but windy in eastern Washington, with lingering rain in western Washington. Additional light rain fell during the middle of the month. Very warm conditions occurred during the weekend of the 22nd and 23rd, as highs were generally in the 60s and low 70s. Very mild overnight low temperatures for late October occurred on Saturday, October 22nd, with some locations near the Tri-Cities experiencing lows in the 50s. The mild start to the day coupled with sunny skies, a warm air mass, and down slope Chinook winds caused temperatures at certain sites to reach into the 70s. A cold front moved through the region on Sunday night and Monday, October 24th was cooler and drier. The dry, continental air mass brought the first significant frost event of the fall on Tuesday morning, October 25th, with low temperatures in the 20s in many locations, and high temperatures in the 50s. After a frosty morning in the 20s on Wednesday, October 26th, the high temperatures were only in the 40s in many locations thanks to increasing cloud cover. The weekend of October 29th and 30th again brought warm temperatures to eastern Washington with highs in the 60s and even low 70s in some locations near Walla Walla. Rain fell in western Washington on Friday, October 28th and Sunday, October 30th, and monthly rainfall was around 5 inches in parts of southwestern Washington. The month ended with cooler and drier air entering the region on Monday, October 31st. Moxee experienced its latest first autumn frost (low temperature below 32 degrees) on record (1990 to present) this year. The first frost of autumn 2011 occurred on October 24th, while the average first frost date is September 28th. Prior to this year, the latest first frost occurred on October 6th, while the earliest occurred on September 17th. October 2011 experienced only 8 days (the last eight days of the month) with low temperatures below 32 degrees, while the October average is 15. The maximum number of days with sub-freezing temperatures was 23 in 2002, while the previous minimum was also 8 days in 2004 and 2005. In fact, the average low temperature of 38°F was 4.9 degrees above average and also 1.6 degrees warmer than the previous warmest October average low temperature. 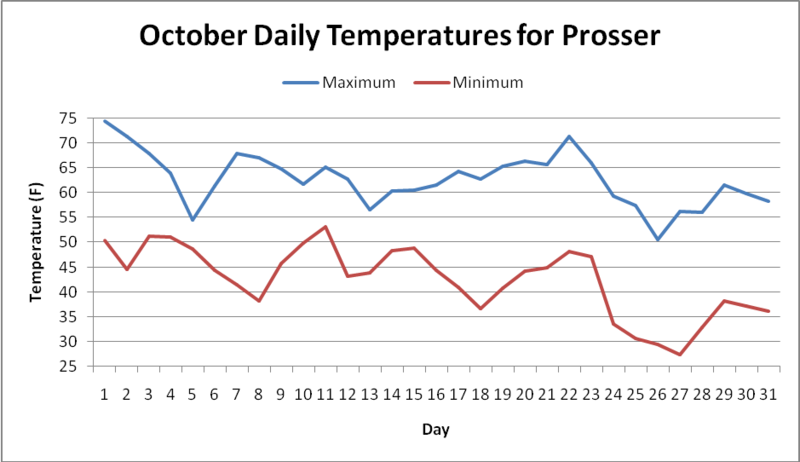 There were three frost days at Prosser (WSU IAREC) this month, which is typical of October. The most October frost days by far (since 1989) was 13 in 2002, while 1994 and 2010 recorded only one each. The first autumn frost occurred on October 25th in 2011, which is about a week later than the average first frost date of October 18th, although there is significant year to year variability. 2006 did not register autumn sub-freezing temperatures until October 30th, while 2000 recorded its first autumn frost on September 23rd. The average high temperature at Prosser (WSU IAREC) in October was 62.7°F, while the average low was 42.5°F. While the monthly average high temperature was 0.4 degrees below normal, the average low temperature was 3.4 degrees (1.8 standard deviations) above average. Temperatures during the month ranged from 74.5°F on October 1st to 27.5°F on October 27th. Prosser received 0.6 inches of rain during October, and the average wind speed was 3.5 mph. 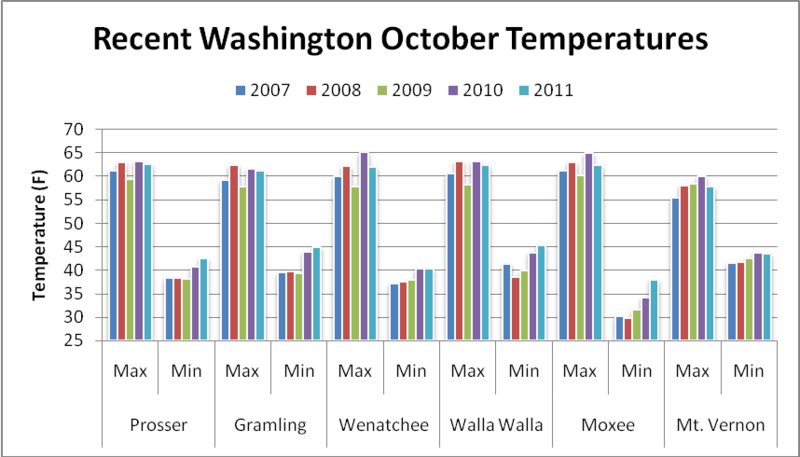 In general, Washington did not experience the extremes in temperature during October 2011 that sometimes occur during this changeable weather month. Average high temperatures were around or slightly below normal due to rainfall and a lack of heat early in the month. Meanwhile, average low temperatures were 2.2 to 4.9 degrees above average in eastern Washington, but only 0.6 degrees warmer than normal in western Washington at Mt. Vernon. The average low temperature of 38°F at Moxee was nearly five degrees and almost two standard deviations above normal. Temperatures at Sequim, Ellisforde, and Brewster Flat fell below freezing during the morning of Thursday the 13th. Temperatures at Sequim dropped into the upper 20s and the Bellingham area fell below freezing during the morning of Sunday, October 16th. Temperatures at Broadview (near Ellensburg) dropped below freezing during the morning of October 17th. The high temperatures of 71 at Prosser (WSU IAREC) and 75 degrees at WSU Tri-Cities were well above normal for late October. The low temperature at CBC Pasco was a balmy 56.1 degrees. The low temperature at the Broadview site dropped to 18 degrees. The low temperature at Pullman dropped to 19 degrees. Nearly an inch of rain fell at the WSU AWN weather station in Long Beach. The high temperature at College Place, near Walla Walla, was a mild 72 degrees. The grape harvest is down 25 to 30% from last year due to last years November freeze, and is two to three weeks later than normal. It is evident that the level of damage was generally worse than expected and varied significantly over short distances (Yakima Herald Republic, October 10th). However, the weather cooperated this month with no significantly cold temperatures until October 25th. Above normal overnight low temperatures were beneficial in keeping cold conditions away from a delayed 2011 apple crop for longer than normal in October. The Prosser 3 Year (2008 to 2010) Average Accumulated Growing Degree Days (GDD) value for April 1 to October 31 is 2,475 GDD, while the 2011 accumulated GDD is still lower at 2,317 GDD, although the mild October has caused the 2011 GDD value to catch up to its value for 2010. On October 31st, 2002, under cold and dry northerly flow, the temperature at Prosser (WSU IAREC) fell to an October record cold reading of 11.4 degrees. La Niña has returned to the tropical Pacific Ocean and is expected to continue through the spring of 2012 such that Washingtons weather is expected to be wetter than normal during the winter with cooler than normal conditions possible later in the winter and spring.